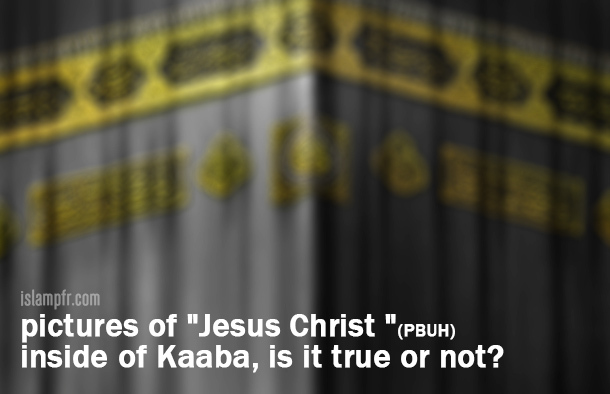 Home Answering religious questions	pictures of “Jesus Christ “(PBUH) inside of Kaaba not to be removed, is it true or not? It is said that at the time of Mecca’s conquest, Prophet Muhammad (PBUH), ordered to remove all the pictures inside of Kaaba but when he reached at the pictures of “Jesus Christ “(PBUH) and his mother Lady “Mary”, he ordered the pictures no to be removed , is it true or not? At the time of ignorance in Mecca there were many pictures and images inside Kaaba, one of them was of Jesus Christ and Lady Mary (PBUT). Jesus Christ (PBUH) was sitting on his mother’s lap in that picture. The house of Kaaba was in this condition until the 8th year after Hegira when Muslims entered Mecca, and Prophet Muhammad (PBUH) ordered all the idols inside of the House of Kaaba to be broken. When Prophet Muhammad (PBUH) entered the house, and observed the images, he ordered to remove all the images and pictures inside the Kaaba, except the images of Jesus Christ and Lady Mary (PBUT), which he pointed out and ordered not to be removed and the images remained in the House of Kaaba. Until they were removed at the time the second Caliph Umar-ibn-Khattab. In another chapter Azraqi wrote down that there was a woman from “Ghusan”, who came to Mecca to perform Hajj. She was impressed by watching this pictures and said to Prophet Muhammad (PBUH) that you are a real Arab. Thus Prophet Muhammad (PBUH) ordered all the images to be removed except the pictures of Lady Mary and Jesus Christ (PBUT). This question may arise that if the house of Kaaba was regarded as the place of idols, how was it then that the images of Jesus Christ and Lady mary (PBUT) were hung in this House? The answer is that the one of the reasons that Arabic people in the age of ignorance placed their idols at the House of Kaaba, was that they regarded the idols as their intercessors before god and in fact these idols were mediators between the god and the people. Thus it is not unlikely that the pictures of Jesus Christ and Lady Mary (PBUT) were present in Kaaba; because it is probable that the Christians were trying to reach the lord by these images based on the same reasoning. And this belief was not contradictory to the beliefs of Arabs to make any prohibition. It also shows that Kaaba was a divine and sacred place even for Christians, at least for those who were in contact with Hejaz.